So its the second day of our Los Angeles trip. In the morning we drove to the LA Farmers Market.Â I have to say this was probably a highlight of the trip and I wish we had something similar in the Bay Area. The market is open every day from early morning until the evening. A lot of different produce stands to browse around, but the highlight are the food stands. We had our brunch at the French Crepe Company. 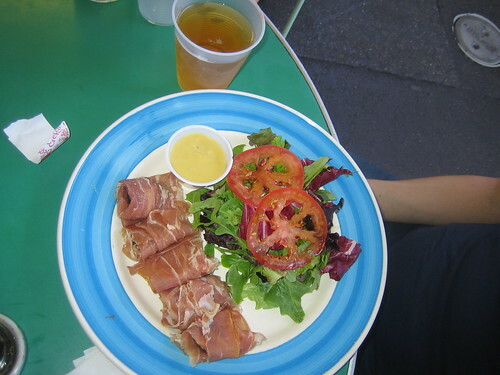 The Prosciutto with Figs was a real treat. We also had the Pan Bagnat, a baguette sandwich stuffed with Tuna salad. Also noteworthy is the French store, wine bar and restaurant Monsieur Marcel. Next time I want to try their Cheese Fondue, it looked great. We briefly checked out the new mall next to the Farmers Market but it is boring, the same stores you get all over the US. So to continue with typical LA shopping we went to Fred Segal on Melrose Avenue, which is more upscale then the Santa Monica counterpart we visited the day before. If you arrive around noon it makes for great people watching and star spotting. I am pretty bad at that since I have no memory for faces. Funny side story to proof the point: Last week I was at a wedding. At the evening dinner Karen pointed out a guy to me and said “I think this is Larry Page”. I told her that I met Larry at a convention a couple of years ago and he looks completely different. Well, later at the party we found out it was Larry Page and Karen was once again right. Apart from the fact that Fred Segal had a great selection of Martin Margiela clothing, I was mostly impressed by the cool Vestax Handy Trax turntable… I will need to get one soon. The next morning we drove to Santa Monica and had breakfast at the Urth Caffe near the beach. The Urth Caffe has a couple of locations throughout LA and I make sure to stop by there at least once on every LA trip. They have excellent breakfast and very good lunch sandwiches. I personally like the Portabello Mushroom Panini the best. Now we were fit for shopping and headed to Fred Segal in Santa Monica. If you are into casual designer fashion, this is the place to hang out for a day. Well, we did not have so much time so on to the 3rd Street Promenade in Santa Monica. Stopped by the Ripcurl store and spent a lot of time at Puzzle Zoo, a great place to find collectibles (like Full Metal Alchemist figures). After a little snack we visited Kidrobot, another great store for obscure figures (they have a store in San Francisco and NY as well). Once you reached the end of the 3rd Street Promenade you can head towards the beach and walk back along the water, but since it was pretty windy we took a shortcut back to the parking garage. To escape the tourist area we drove to Montana Avenue in Santa Monica. I suggest you park somewhere at Montana and 12th Street and visit the many boutiques and stores along Montana. We stopped by Di Dios’ Italian Ice and had delicious Gelato. Finally we headed to some of my favorite LA neighborhoods the little underground Japantown around Sawtelle Blvd. (between Missouri Ave and W. Olympic Blvd). As ususal we went right to Giant Robot to browse through contemporary Japanese street culture toys and books. If thats not enough visit also Giant Robot 2 just across the street. After dinner at Gr/eats (yes thats the Giant Robot restaurant next to Giant Robot 2) we drove back to the hotel to get some rest and be ready for day 2. 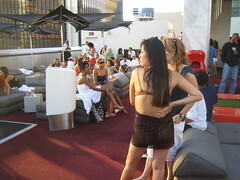 We arrived early Sunday evening and checked into the Standard Hotel in downtown LA. I think the Standard Hotel is a good value and I like the modern minimalist interior. As soon as you arrive you feel immedatly that you are in LA. After I droppped the luggage I headed straight to the Rooftop Bar (make sure you got a wristband downstairs) and relaxed with a White Russian at the Sunday afternoon pool party. After a while you will get annoyed by the LA crowd and also you need to eat something. 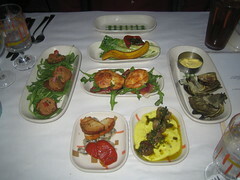 I headed over to Ciudad a Latin American restaurant and Tapas bar with a nice outside patio. Sunday evening they feature an excellent “Tapas only” menu and make sure to try their excellent Mojitos. On the way back I stopped quickly by the Westin Bonaventure Hotel and enjoyed the view from the top floor and glass elevator (which was used in the movie Total Recall).